The Rosetta probe is currently orbiting comet 67P/Churyumov-Gerasimenko, shown here in an image by the NAVCAM instrument. It is likely the probe will end its life by coming to rest on the comet's surface. Europe's Rosetta spacecraft, which is currently orbiting a comet as it hurtles around the sun, has been given nine additional months of operation time and will likely end its life by spiraling down onto the comet's surface, officials said. The Rosetta probe is currently orbiting Comet 67P/Churyumov-Gerasimenko, which is zooming toward its closest approach to the sun in mid-August. The European Space Agency (ESA) said in a statement yesterday (June 23) that it would extend the mission, which was originally funded until the end of December 2015, through September 2016. By December of 2015, Rosetta will no longer receive enough sunlight to continue operations, and its propellant will also be depleted. Patrick Martin, Rosetta's mission manager, said in the statement that "the most logical way to end the mission is to set Rosetta down on the surface [of the comet]." "But there is still a lot to do to confirm that this end-of-mission scenario is possible," Martin added. "We'll first have to see what the status of the spacecraft is after perihelion [closest solar approach] and how well it is performing close to the comet, and later we will have to try and determine where on the surface we can have a touchdown." According to the statement from ESA, Rosetta would likely spiral down to the surface of Comet 67P "over a period of about three months," and would be able to continue science operations during that descent. This would allow Rosetta, which is equipped with a much larger suite of instruments than Philae, to collect data about the comet at incredibly close distances. Comet 67P will reach its closest approach to the sun on Aug. 13, and Rosetta will follow the craft as it heads back out into the dark regions of the solar system. After December 2015, as the comet moves farther away from the sun, there will not be enough light to charge Rosetta's solar-powered suite of scientific instruments, the ESA statement said. 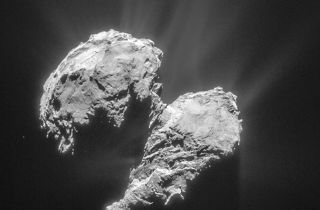 "This is fantastic news for science," said Matt Taylor, ESA’s Rosetta Project scientist. "We’ll be able to monitor the decline in the comet's activity as we move away from the sun again, and we'll have the opportunity to fly closer to the comet to continue collecting more unique data. By comparing detailed 'before and after' data, we’ll have a much better understanding of how comets evolve during their lifetimes." In its study of 67P, Rosetta has already illuminated details about the evolution of comets as they travel toward the sun, and the extended mission will offer even more insight into that process. In addition, scientists have learned about the materials that comets diffuse into space as they head toward the sun and warm up, and the connection between comets and materials found on Earth. The extended run for Rosetta might also make it possible for ground-based telescopes to offer complementary observations of the comet, mission team members said.